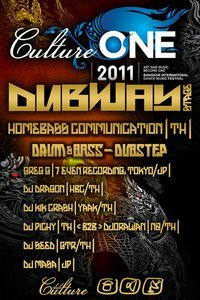 Drum ‘n’ Bass and Dub Step hosted by Home Bass Communications and its leader DJ DRAGON. International guest is GREG G (France) from 7even Recordings, Tokyo. 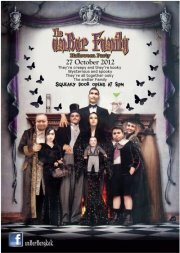 As well as Pichy, Orawan, Kik Crash from Yaak Records, Dj Seed (GTR) and Masa. Bringing together the best selectors from Asia and beyond with the bass heavy music. 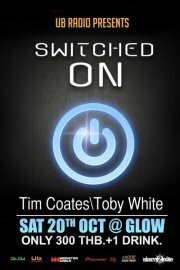 Get ready for an awesome night of DnB, Dub step and Funkey beat. Top dance DJs from Thailand and across the globe set up camp lakeside by the Bangkok International Trade and Exhibition Centre for the pumping CultureONE International Dance Music Festival: CultureONE 2011. Greg G is one of the original French Dubstep DJs. He starts mixing Jungle Music in 1997 and spins later UK Garage and Dubstep in France, promoting events in Paris and his hometown Nantes, and running several radio shows on the French airwaves. In 2008 Greg G launches his own 7even Recordings label, in order to push the French Dubstep scene on wax. After only one year and less than ten releases, 7even has already gained a strong reputation of quality on the international scene, notably featuring on a special ‘Hotflush vs 7even’ showcase in january 2009 at Mary Anne Hobbs’ Experimental Show (BBC Radio One). He is also the promotor of the n° 1 Dubstep night in Paris, the ‘Basement Ltd.’ nights, in collaboration with his partner in sound Synaptic. Inviting the cream of the scene, those nights are held at ‘Le Nouveau Casino’ club, a venue with one of the best sound system in the french capital city. Greg G has played alongside Skream, Benga, Goth Trad, Pinch, Mala, D1, Scuba, Kode 9, Youngsta, Kromestar and N-Type amongst others. Right now living in Tokyo – Japan, catch his sets at regular events such as Goth Trad’s Back To Chill party at Club Asia and Drum & Bass vs. Dubstep Warz at Unit amongst others.